Bath (population 310) is a small town located on the banks of the East Branch of the Illinois River. The town is situated on the western edge of Mason County on Il. Rt. 78, approximately 9 miles south of Havana. There is limited information available on the IHSA web site (www.ihsa.org) regarding the high school. There is listed a Bath-Lynchburg High School and a Bath Balyki High School under Boys Basketball. Lynchburg is a township around Bath and Kilbourne is a town near Bath. Hence, the name Balyki comes from BAth + LYnchburg + Kilbourne. The school faired quite well in boys' basketball. Bath Balyki HS was deactivated in 1991. The students from Bath are now attending the Havana school system. The pages were developed alumnus Kenny Crookes, a great fan of the Glory Days site. These pages are fun to read with some classic photos from the "glory days" of Bath Balyki High School! If you have any further information regarding Bath-Lynchburg please contact us at eganann@sbcglobal.net . The Ramblers were a force to be reckoned with in boys' basketball all the way to the end of the Bath-Lynchburg H.S. existence. The Bath-Lynchburg boys won 3 District Championships in basketball, and finished as runner-up three more times! "Bath-Lynchburg HS in the early 1930's was known as the "Sea Gulls", but 40 students petitioned the county newspaper in 1933 and said they wanted to be called the "Ramblers". The editor said OK: Ramblers it is." 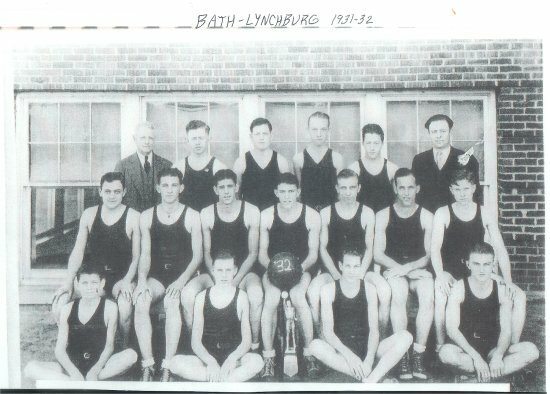 We are also told that the Bath-Lynchburg High School building in Bath (pictured at the top of this page) housed its gymnasium on the second floor. The gym was said to be quaint but sturdy. This gym was later converted to other uses for the school when the new "Thunderdome" gymnasium was built. Front row, from left: Walter Sarff, Andrew Lindsay, Emery Sarff, John Kenneth Fletcher. 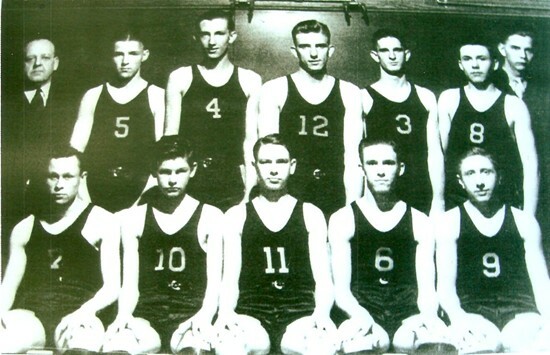 Middle row, from left: Basil Schaeffer, Roy Sarff, Clyde Coddington, Floyd Coddington, Gerald (Charlie) Allen, Tom Minor, Harry Clemons. The above headline is sometimes subjective, but in 1931-32, the basketball team achieved that status. Coach Maurice Root (a Carthage College graduate) guided the team to a 28-1 record, winning these championships: Mason County tournament, West Central Conference (8-0), Mason City District tournament; plus third place in the Springfield Sectional tourney. The boys won four games in the County tournament whipping Havana twice and beating Kilbourne and San Jose. The first win over Havana in the tourney was a 6-4 victory. Havana slowed the game greatly because Bath had trampled them 50-5 earlier in the season. They met again, this time in the championship game, with B-L winning 20-8. In the District tournament, tall center Clyde Coddington, Emory Sarff and Gerald Allen took turns leading the team in scoring. They beat Greenview 31-20, Havana 19-9 and secured the title with a 22-19 come-from-behind win over Athens. They lost their only game of the season in the semi-final of the Sectional played at the State Arsenal (a huge castle-like building) on March 18, 1932, a one point loss to Beardstown (21-20). B-L had beaten the Tigers by eight points earlier in the year. Their 27th straight win (the longest undefeated streak in the state) occurred the night before when they beat Jerseyville 34-24, in the Sectional opener. The Ramblers edged Lincoln 19-18 in the third place game on March 19, thereby establishing themselves as one of the 24 best teams in the state (811 schools had begun district play in March, and only eight teams went to the state finals). Sports Editor Bob Drysdale of the Springfield State Journal wrote in his column on March 20: "Volunteers offered to help with writing the headline for the Bath-Lincoln game. There were a half dozen variations of BATH CLEANS LINCOLN SATURDAY NIGHT. Personally, we'd say that Lincoln, which had expected to take Bath, failed to find the stopper, so its game was a washout. But one thing is certain, Bath cleaned up a lot of central Illinois hardwoods before it was stopped in the semi-finals." Clyde Coddington and Gerald Allen paced the team during the season and had plenty of help from Clyde's brother Floyd, Roy and Emory Sarff, Andrew Lindsay, Thomas Minor, Bazzile Schaeffer and Harry Clemons. For 29 games the Ramblers averaged beating their opponents by a 26-13 margin. The best team in the history of the school? YOU BET! 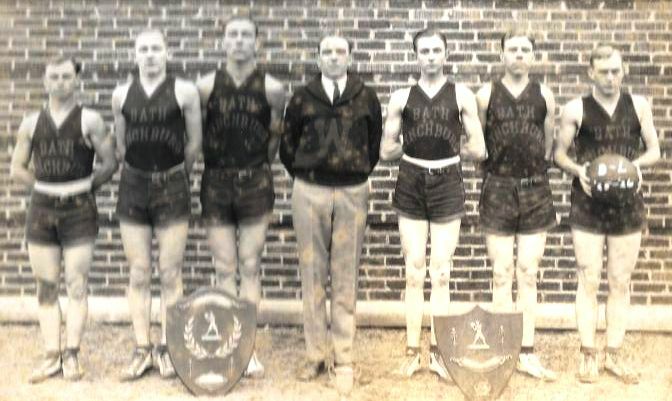 As the Bath-Lynchburg HS "Ramblers"
Standing, from left: Homer Bartholomew (Principal/coach), Johnie Conway, Lowell Markert, Raymond Middelkamp, Clifford Coddington, Arthur Elmer Finch, Ralph Siltman. Seated, from left: Melvin Dobson, Allen Connolly, Morris Bell, Robert Dierker, Ira Everett Smith. ....Photo courtesy of Gerta Griffin. Bath-Lynchburg won 3 County Tourney championships, finishing second 2 other times!!" He taught in one-room country schools in the Loami and New Berlin areas from 1910-21. He was the first basketball coach in the history of New Berlin High School (1917-21). In 1922 he moved to the Chatham school district where he coached boys and girls teams until 1936. 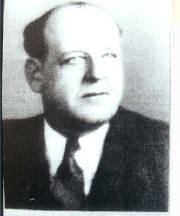 He was also elevated to Principal of both the grade and high schools in 1931 at Chatham. In September 1936 he took the job of Supt/Principal/Teacher/Coach of the Bath-Lynchburg schools. On an early January 1938 Saturday, referees Ron Gibbs (who would officiate in the NFL from 1940 to 1962) and Homer Bartholomew, worked a morning semi-final game at Athens in the annual Athens-Greenview basketball tournament. After the game was over the two ref's drove to Greenview and officiated in a late morning semi-final. At the conclusion of the game, Bartholomew drove home to Bath where he was a teacher/coach for the B-L High School. He coached his team to a win over Forest City in the late afternoon. When that game was over he drove to Athens and worked the tourney championship game that night with Gibbs. Four games in one day! When he passed away, hundreds of his friends and fans paid their respects and turned out. As his friend Bob Drysdale, Sports Editor of the State Journal (Springfield) wrote: "He was an ardent booster for all sports. And with it all he made hundreds of friends. His influence helped to send scores of boys (and girls) into successful careers. His kind can not be replaced in the school room, the athletic field, or in life." Both starting pitchers went the distance; Ken Bracey (Mason City) 16 innings, Larry Lippert (Bath-Lynchburg) 15 2/3 innings. Larry did not mention that during his high school career he also pitched both games of a double-hitter and both games were no hitters. He also played basketball ". Goes out to the Village of Bath, Havana Public Library, the A. Lincoln Presidential Library for microfilm records of State Journal-Register (Springfield) and Mason County Democrat (Havana). And a very SPECIAL gratitude goes out to a great friend of the Glory Days website, Phil Shadid, who provided most of the research for this page.